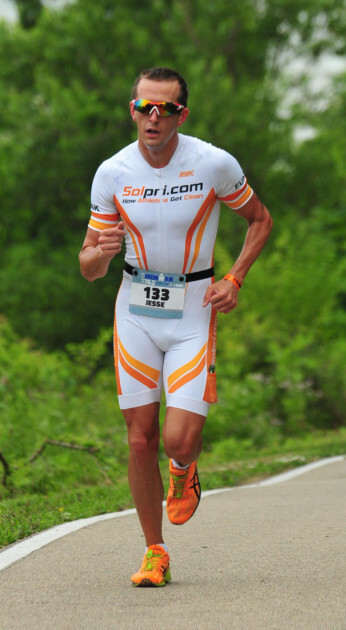 Solpri designs products to protect your skin from the hazards of being an athlete – using science. We create our products based on scientific research and known reactions – not voodoo. This means you will get the best products available to our knowledge while being sure you aren’t using fad ingredients with unknown side-effects. 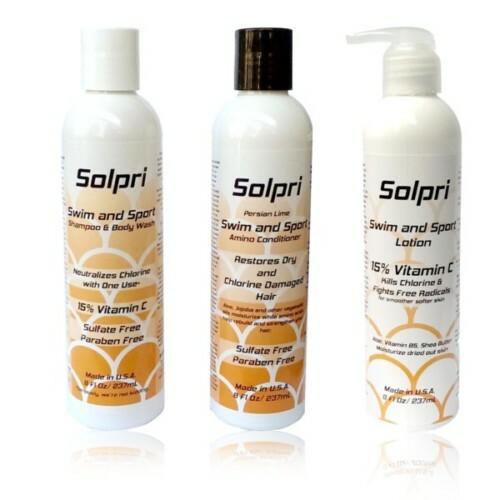 Solpri Swim series protects your skin from chlorine by breaking it down naturally, with Vitamin C.
Zap any missed chlorine with the Vitamin C lotion and moisturize your skin back to its happy healthy self. The Shield series is designed to do one thing: effectively wash away fungus and bacteria before they effect you. Our special blend of essential oils including lemongrass, tea tree, eucalyptus, lime and orange have been balanced to effectively kill off fungus and bacteria. Shield Series bar soap is designed to do one thing – help prevent your skin from picking up nasty fungus and bacteria from the gym. Causes of jock itch, ringworm, foot fungus and other irritating skin problems lie in wait all around gym surfaces. Shield bar soap is your first line of defense against irritating and embarrassing skin problems. 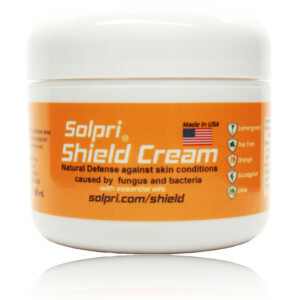 Shield Series Cream is your go-to pal when you’ve already got a problem. The beeswax in the cream allows it to sit on your skin longer – letting the essential oils go to work on your fungal or bacterial issue. A host of helpful moisturizing ingredients also work to bring your skin back to perfect shape after it takes care of your skin problem. Our guarantee is simple: our products will work to your satisfaction or we’ll send you a 100% refund including shipping. Plus, because we know you hate going to post office (sorry postal workers), you don’t even have to return any product. Just send us an e-mail or give us a call and we’ll take care of you. Over a winter of indoor training in the pool I developed a skin rash around my eyes. Was it the goggles? Nope. It was actually the chlorine combined with the dry weather that had lead to my itchy red irritated skin around my eyes. So I tried one product, then another and another. Some of them worked… kind of. But they would actually make my skin sting or be irritated while getting rid of the chlorine. I knew I had to come up with something better. Thus Solpri was born. A gentle formula that’s skin safe, avoiding sulfates so your skin isn’t irritated, while utilizing a high dose of vitamin C to get rid of the chlorine and nourish your skin back to health. So I’ve been there with you. The itchy irritated annoying skin that bothers you all day and won’t go away even after you shower. Now I’ve expanded my mission beyond just swimmers and triathletes. I’m set on helping all athlete’s skin stay healthy so you can proudly show off all the hard work you’ve put in. Yes, all of our products are cruelty free. We use palm oil in our bar soap and yes it is RSPO Identity Preserved certified. This means each batch of palm oil used in our bar soap can be traced back to a single source. Because of this we can ensure that our palm oil is both sustainable and fair trade. We currently ship internationally to Canada, France and the UK. We don’t currently have any other international shipping set up, but do plan to offer this in the future. 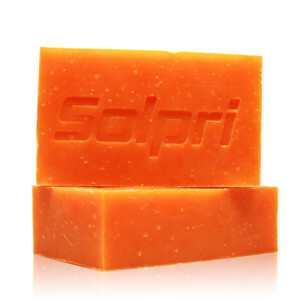 If you have an interest in Solpri and are a resident outside of the United States please e-mail us at contact (at) solpri.com with the subject line (International Interest – Your Country Here). I.e. if you’re from Canada your subject line should read “International Interest – Canada.” This will help us figure out which countries have the greatest interest in Solpri and where to start first with international shipments. All of our products can be considered vegan except the shield cream which contains beeswax. Can You Help Me in Another Language/ Pouvez Vous M'aider Dans Un Autre Langue? Yes, a little bit in french. Thanks for subscribing! Stay tuned for the latest news.